San Francisco Percent for Public Art Program: San Francisco Art Commission, 5000 sq. ft., card catalog cards and plaster. Fifty thousand library cards surface the wall which divides the closed stacks and circulating collection of the San Francisco Public Library. Each of the library cards has a hand-written citation on it from the book it represents, or else from another book which relates to it by subject. The cards are covered by a thin veneer of artisans plaster. 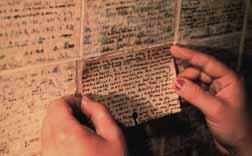 Nearly two-hundred scribes wrote on the cards in a dozen different languages. The overlay of written citations on the informational text of each card represents the interface of a community with a collection, and distinguishes the arbitrary accumulation of information from the process of selection, which is associated with understanding and knowledge. Untitled (San Francisco General Hospital Parking Facility) (1991-96). GFRC panels, glass brick and ceramic frit. The San Francisco General Hospital Parking Facility is located on the site of an old Municipal Railway car barn. Auto transportation has had a major impact on the hospital and surrounding communities which were bifurcated by the construction of Highway 101, the city's main north-south artery. I was interested in creating an archive of the site's history within the parking facility. The "hospital cross" shaped windows in the garage are a reinterpretation of brick and mortar decoration on the old San Francisco General Hospital buildings. The cross shaped window is a way of identifying the garage as part of the hospital campus, while creating a site for photographic archives of the hospital, the surrounding neighborhood and the history of transportation. The archival images are baked on to the glass block in the windows, and are visible from within in the day and from the outside at night. 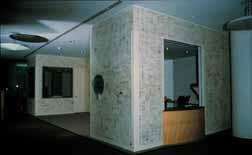 These images are also used throughout the building as part of the signage system. The San Francisco General Hospital Parking Facility project is pictured in figures 25 and 26 in Ann Chamberlain's Biography. Includes 400 ceramic tiles, each 11" x 15", courtyard and design. The UCSF MT Zion Cancer Center Healing Garden is an ongoing process of collaboration with the community of patients and caregivers at the hospital. The garden is intended to give a permanent place for the stories of those who come to the building repeatedly for treatment. In its final form, the Cancer Garden will be flanked by a seventy-foot wall of ceramic tablets, each containing the impression of a plant and the story of a patient, friend or family member who has dealt with illness. The tiles will become a permanent part of the building's architecture and speak of the personal experience of those who are going through cancer, AIDS or other life threatening illnesses. Part of the process of redesigning the garden has been the creation of events and rituals which enable patients and staff to come together in the garden to collectively and individually tell their stories and express their feelings, whether in celebration, thanks or mourning. Within the garden is a place for hanging wishes in trees and planting thoughts and/or prayers. The garden has become a place which contains the memories and traces of those who pass through it. The UCSF MT Zion Healing Garden is pictured in figure 9 in T. Cohn's essay, section ii. All text © Ann Chamberlain.